Samsung India Electronics has announced expansion of its Noida plant with an investment of Rs 1,970 crore, strengthening its commitment to ‘Make in India’ and ‘Make for India’. The Government of Uttar Pradesh approved the investment by Samsung India Electronics under Super Mega A by the state’s Cabinet Committee in Lucknow today. 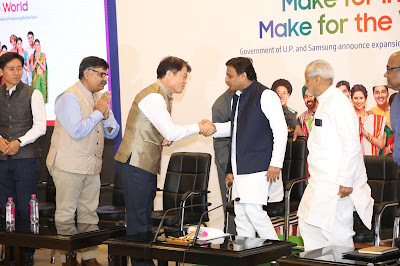 A Memorandum of Understanding was signed between Uttar Pradesh Chief Secretary, Rahul Bhatnagar and HC Hong, President and CEO, Samsung India Electronics, in the presence of Chief Minister Akhilesh Yadav. Samsung started its Noida plant in 1996 and continues to provide cutting edge technology and enriching experiences for customers across India from the Noida plant, with a large ecosystem of suppliers in the National Capital Region. 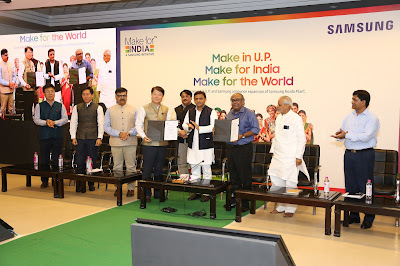 As a responsible citizen, Samsung is involved in community development around the facility at Noida and across the state of Uttar Pradesh through contributions to education, skill development and healthcare initiatives. In a journey that started in 1995, Samsung set new benchmarks in innovation led manufacturing and consumer marketing, and established itself as a truly national brand. Along the way, it effectively consolidated its position in India with two factories, three RnD centres and a design centre, employing over 40,000 people and establishing the largest sales and service network by any company in the country. By not only fulfilling its commitment to ‘Make in India’, but also living its promise of ‘Make for India’, Samsung has emerged as a truly Indian company at heart.